The long awaited announcement of the 2014/15 premier league fixtures is finally done. Chelsea will travel to Burnley on the first day of the season, followed by our first home match against Leicester City. We will face two new promoted teams on the first day. If we can just the 6points from the 1st two games, it will be a good go. We can then build on that and start the new season a strong title favourite. I think we will have a good season. Blue is the colour! Cant wait for us to shine next season! Up blues! 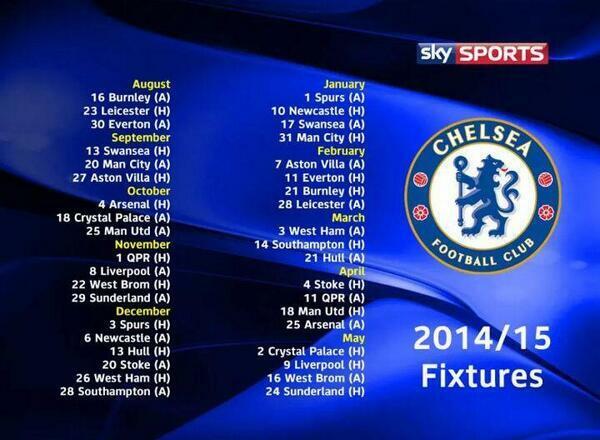 Chelseafc 2014/2015 seasons fixtures have been gud for us nd we are expected to win d league. Now all we need is to win the matches, whether we play big or small teams. Z fixture favour blue. Blue wl play z 2nd game with top 5 with home. If z little horse is changed to ‘big one’, we wl definetly win z title. up blues wetha we play wt big club or small what we need is to capture that 3 point.that truphy i need it this seson.